Being a Midwestern American country girl, the tradition of Christmas Pudding is one that I did not know of growing up, besides in carols sung and Dickens stories. 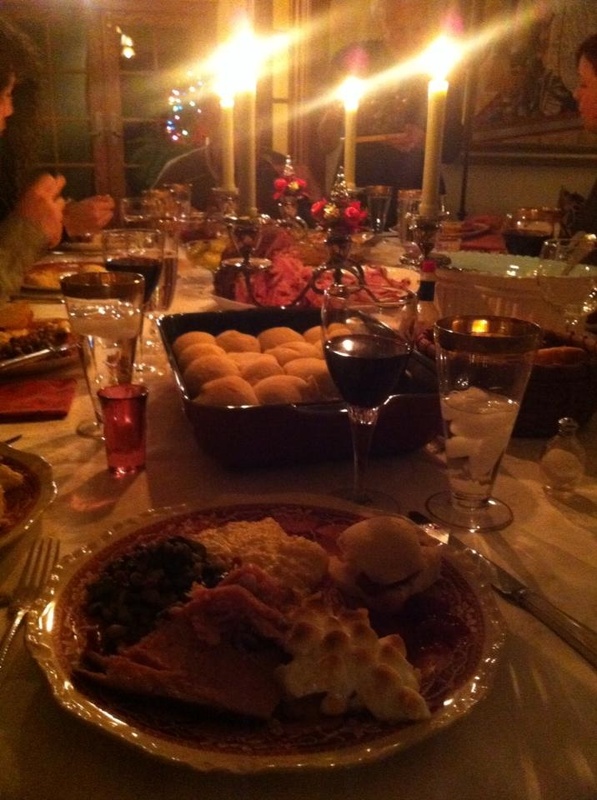 But last Christmas I had the wonderful pleasure of being invited to the Brand/Townsend family Christmas Dinner in Ireland. The Christmas Pudding was a special tradition in their family; the excitement preceding it’s arrival to the table, the oh’s and ah’s as the brandy was lit and the smiling faces that accompanied the first bite – was all a very special moment for me to observe and partake in. 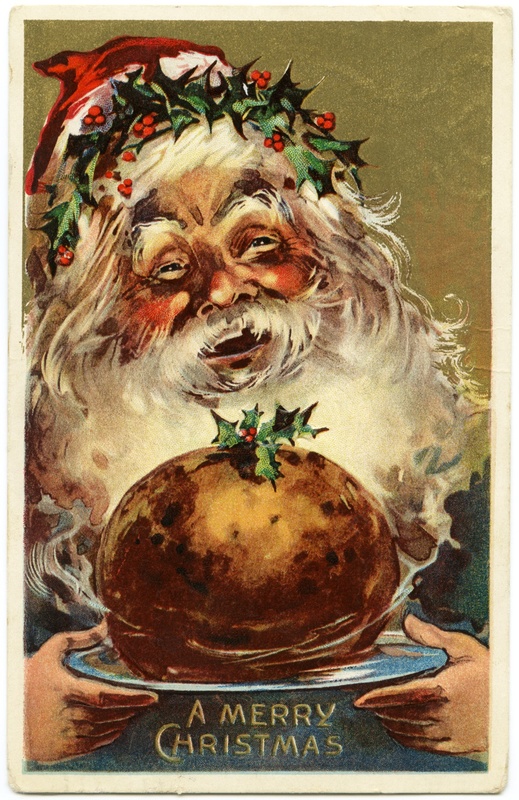 The Christmas Pudding has folk origins as far back as medieval times but the pudding we know of today only starts to appear in recipes in the 17th century. Ancient edible cousins of the Christmas Pudding may have been mince pies and even Roman “pottage”, both meat preservation methods utilizing fruits and spices and often in a pastry. 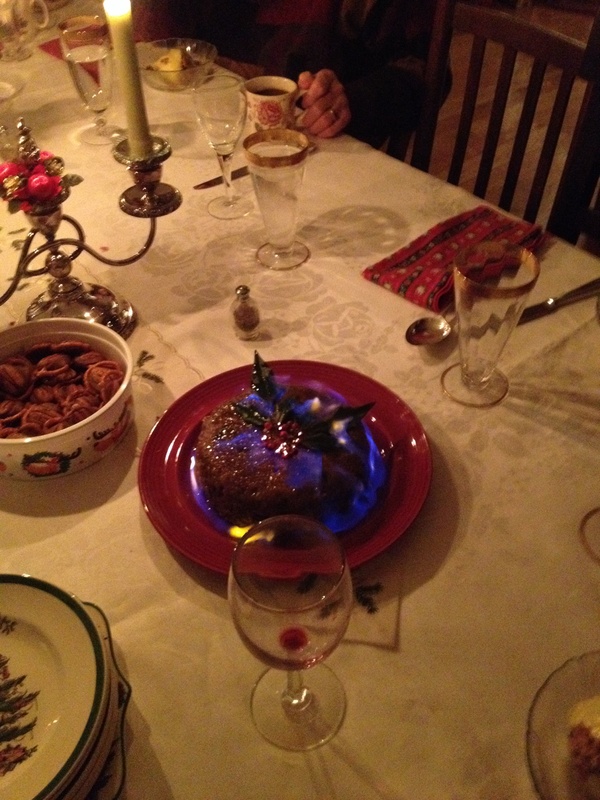 The Victorians finished the final version we know so well: a sweet and potent concoction of liqour soaked fruits bound together with eggs, sugars, steamed to perfection, then served topped with holly, soaked in brandy and lit a-fire! With only a few hours left before we were to depart today for Christmas Eve diner with dear friends, I decided to attempt the sacred dish. Scouring recipes in both the few cooks books I have unpacked and on-line, I devised a simple and quicker version of a dish that according to most recipes should have fruit swimming in booze at least 24 hours in advance and then steaming for 6 hours…no time for that. So depending on what time your Christmas dinner is today you too may be able to introduce this age old tradition to your family festivities with plenty of “oohs and aahs” guaranteed ! I hope you and yours enjoy this holiday season with all the delicious dishes and festive traditions it holds in store for you! 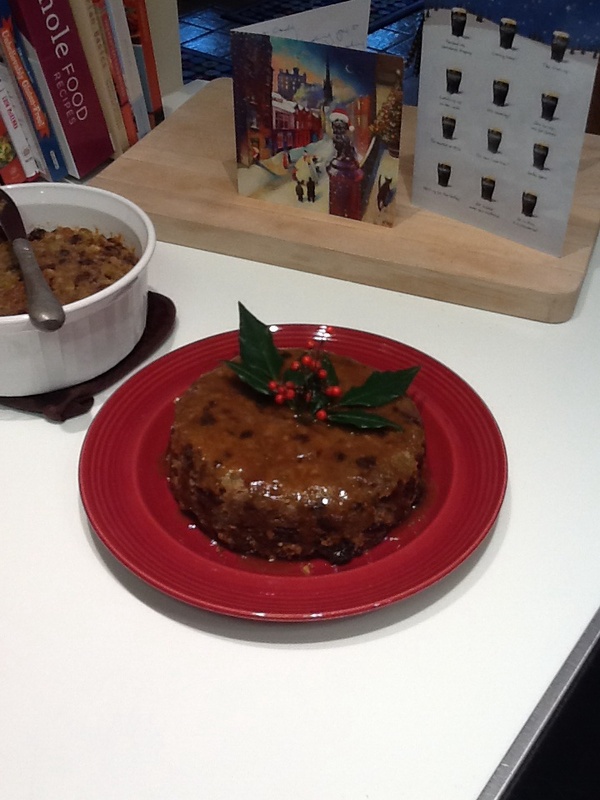 Merry Christmas To All…And To All A Christmas Pudding! ….And now the how-to details! With no Pudding dish, no Pudding cloth, no Pudding steamer…it still came out perfectly delicious! Though my archiving of culinary creations is not always the most idea, I did jot down the steps and I do recommend reading a few other recipes if my chicken-scratch just isn’t clear. Soak 1 12oz box of raisins and 1 12oz box of golden raisins or cran-raisins, with the zest of one large orange and it’s juice in 5oz of rum (should use brandy but all I had was rum in the cabinet) for as long as you can, i soaked about an hour and they were great, a full day would have been even better. Cream together 8oz of soften butter and 8oz of brown sugar (dark is best) until fluffy. Then add slowly 4 pre-beaten large egg and a dash of vanilla. Then with a spatula add the fruit and juices then 4 oz of all purpose flour and 4 oz of bread crumbs, 1 tbls of cinnamon and 1 tbls of nutmeg. Mix well. I split this amount into two portions. Butter 2 Corning ware dishes and line the bottom with a cut to size piece of parchment. Spoon in the batter, smoothing out the top and tightly foil wrap the entire bowl. Place the bowls into large soup pots on the stove with an inverted saucer or foil balls on the bottom of the pan to sit the pudding bowl upon so that it is not touching the bottom of the soup pot. Fill with water half way up sides and begin to steam, keeping an eye on the water level, almost 3 hours for a split recipe. Do a knife test into the center of the pudding to tell if done. To serve, turn out on to a serving plate, top with a toffee made of equal parts butter and brown sugar melted smooth and a 1/4 cup of cream added in and cooked a bit longer. To serve at the table, warm up a bit of brandy in a metal measuring cup over your dinner table candle, pour over the pudding and light! 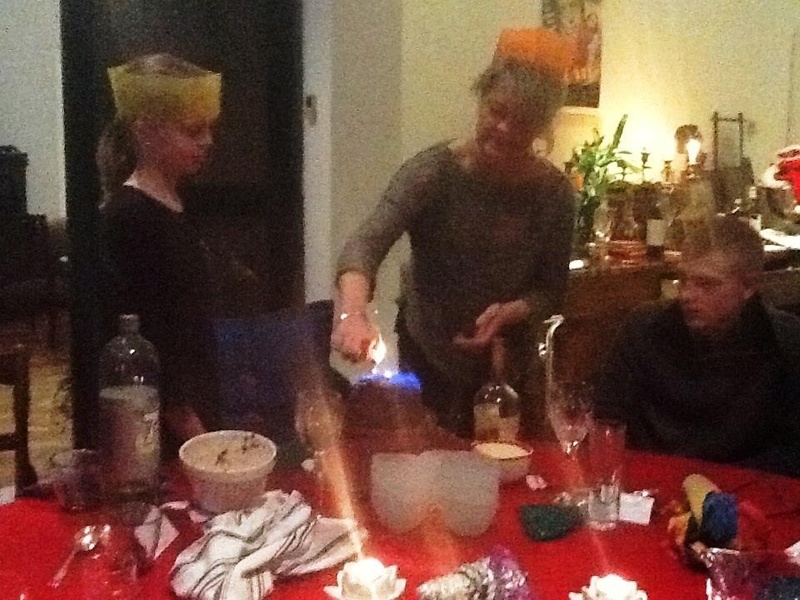 The key is to have the booze warmed enough (but not boiling) in order for it to ignite. and for a little luck hide a coin in the pudding and the lucky guest is guaranteed prosperity in the coming new year! At least that’s what they say!! 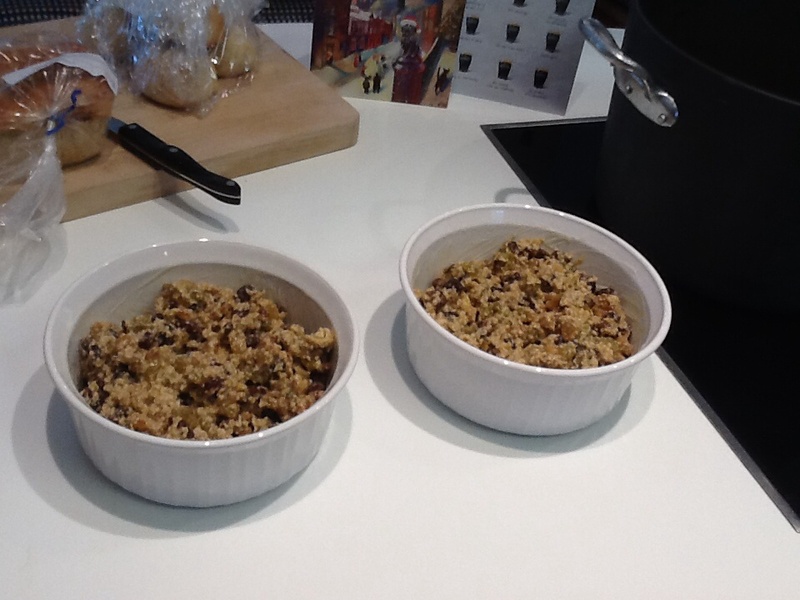 I was fortunate enough to be seated at that beautiful Christmas dinner table and to taste the Rucksackfoodie’s Christmas pudding. It was every bit as delicious as it looks in the photo. 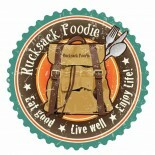 This entry was posted on December 25, 2013 by Rucksack Foodie in FOOD !, Friends, History, Recipes and tagged Christmas Pudding, Irish Christmas Pudding, rucksack foodie.